The Slog Blog – Love. Life. Practice. Niall has a stellar post today about his habits, and how he’s managed to incorporate a whole bunch of them into his life. It’s inspiring, it’s provocative, it’s about as chock-full of good advice about improving your life incrementally as you can get. And not only that, but he’s posting from mother-frakkin’ KATHMANDU, NEPAL! The man takes the whole concept of BadAss Blogger to a whole new level. Hats off to you, Niall. (Insert several expletives, epithets, and grumbling). Why? Because I’m also duty-bound, by my self-image as a blogger, to come up with something inspirational today. Something that you will read and find some catalytic reaction with, so that you’ll rush towards the rest of your week (with only a short stopoff to tweet about it) and be all set to continue your own practice of making hard times happier. Problem is, I’m coming at this from a place where it’s kind of hard to be “inspirational.” I’ve been camping for a week at an event north of Seattle, where I taught workshops, hosted four separate evening salons, and also volunteered to help other presenters. That was combined with several personal FGO’s (you know, frakkin’ growth opportunities) before, during and after the event, which I’m really good at compartmentalizing for a while…but it’s Monday, and the dreaded “con drop” is in full force. So really, you should probably just go read Niall’s blog, he’s going to be far more uplifting and happy and badass inspirational. But that happy little chorus of self-castigation inspired a reaction: a gritty, angry, stubborn realization: I’m still trying. To plod (one’s way) perseveringly especially against difficulty. And you know what? Both work fine for my mood today. The slog is what you use when you’re inching your way towards daylight, when you don’t have the wherewithal to revel in long lists of your successes. 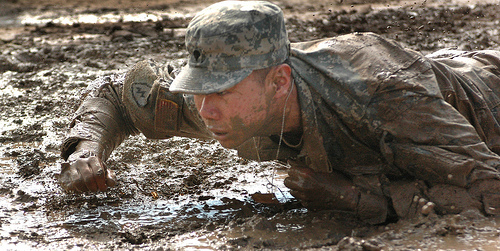 You put your head down, and you move slightly further ahead in the mud. Your world may feel like it’s been reduced to a flat plane of cold, slippery mud, and you can’t do anything but claw your way forward elbow by elbow…but by God, you will leave a deep trail of elbow-prints in the mud behind you. I’ve been in situations like the one pictured above, and there is something interesting about it that I think can be misinterpreted from the picture. I can’t speak for the soldier in the muck up there, but you see how he’s looking ahead? You might think that he’s “got his eye on the prize” or somesuch. In my experience, that’s not how it works. Yeah, you look up, just to make sure you’re roughly headed in the right direction, but if you’re in a position where you gotta slog, you don’t really think that far ahead. It’s that foot of mud in front of you and the process of transforming it into the foot of mud behind you that really occupies your attention. Whatever goal you originally had when you first stepped into the muck isn’t going to help in the slog; that’s not a big picture thing. Instead, you simply slog for the sake of slogging. You can forget entirely about why you started the journey in the first place; doesn’t matter, you just keep moving. Inch by inch, forward. You slid back? Doesn’t matter; keep slogging. Somebody dropped a rock in front of you? Doesn’t matter; slog to the left, slog to the right, until the rock isn’t in front of you any more, then keep slogging forward. If you make slogging a part of your practice, then when you have days that aren’t like the one Niall describes, you may still make progress towards the goals that seemed to have disappeared under the mud and fog and rain and cold of life. Of course the soldier in the muck, the idea of inching your way through a tunnel towards daylight, they’re all metaphors. Slogging looks different for everyone. For me, it’s this entry: it’s recognizing the hard truth that I don’t feel inspired, much less inspiring, and yet I have a commitment to produce an entry today, regardless. It’s looking at the other things around the house – laundry, editing for other clients, even a cigar I “have” to smoke and review – and recognizing that even though I don’t want to do them, they will not get less in need of doing by my inaction. So I do them. Not because I’m convinced that having my socks matched will improve things – but it will be one less thing that needs doing. When I wake up tomorrow, whatever my mood is, I will know that I maintained my writing schedule. I will cook myself my dinner tonight, I will even floss my teeth, and at the end of the Day of Slog I will be an inch or two closer to the goal. That goal is not, by the way, to become the person I want to be. It’s to recognize, accept, and internalize the wonder of the person I am. That, I believe, is a much harder task. Far beyond the scope of a Slog Blog. Maybe we’ll be up to tackling that idea on Friday. If you can’t fly, then run, if you can’t run, then walk, if you can’t walk, then crawl, but whatever you do, you have to keep moving forward. – Martin Luther King, Jr. Timely post. I’m slogging through my blog this summer, was doing really well and then hit a wall, then sputtered, then stopped. All momentum for progress, traffic, search results – gone. Coincidentally, right before hitting my goal for ramping the site up. After a week’s vacation where I had every intention of working on the site but didn’t, finally managed to work up a post last night. And then just taking a few minutes to check traffic at 1 in the morning, I learned that a seperate post had been linked from a subReddit on one of the shows I cover that created a small traffic bump, and that’s got me jazzed again. But it’s hard dealing with the voices in my head for something I SHOULD be doing, something I LIKE doing, but still somehow NOT doing. Slog indeed. Thanks for the post, hope you had a good trip. Interesting how the self-sabotage (in the form of de-motivation) came right before the ramping-up plans. I wonder if on some subconscious level you’re afraid of having it work? One thing I struggle with is the “comfort zone” of scarcity – so when things are looking abundant, I don’t know how to deal with it. Things going wrong, trying to stretch not-quite-enough to fit a-little-too-much, that I can do, backwards and in high heels. But things going right? WTF is up with that? I think that’s a part of it. But I think it’s mostly the idea that if it becomes successful, then it becomes a COMMITTMENT. That the goal I set for myself becomes an obligation to others. For something that’s an interesting hobby, but certainly isn’t going to pay the bills anytime soon (earned .01 in June, .00 in July). Plus the overwhelming urge to re-write posts, berating myself for not getting it right the first time, etc. Plus the huge list of items I know I need to do for a chance to achieve success. Pingback: life isn't out to get you » Love. Life. Practice. Love. Life. Practice.